From the southern end of Puget Sound, Budd Inlet leads still further south to Olympia, the capital of Washington. On September 27, 1865, Isaac Dofflemyer and his wife Susan filed a land grant claim for 316 acres that included the point of land on the eastern side of the entrance to Budd Inlet. This point, which Lieutenant Charles T. Wilkes of the United States Exploring Expedition had named Brown’s Point in 1841, in honor of James Brown, a carpenter’s mate for the expedition, subsequently came to be known as Dofflemeyer Point. 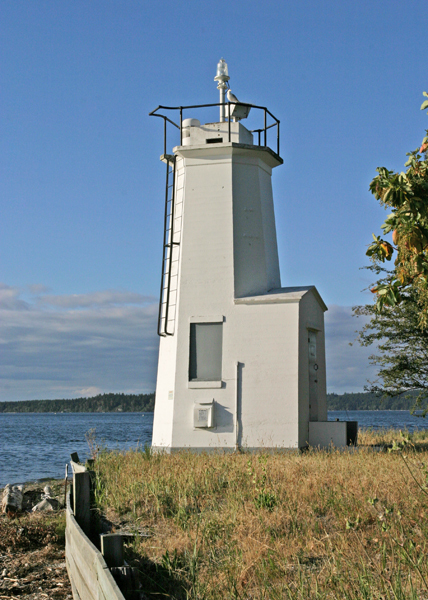 A lens lantern atop a twelve-foot stake was established at the point on December 13, 1887, the same year the City of Olympia built a mile-long dock at the head of Budd Inlet. The boat basin at Olympia was first dredged in the early 1890s, and subsequent work allowed ship building to be carried out at Olympia during World War I. The Port of Olympia was created in 1992, with lumber as its primary cargo. Between 1928 and 1930, 198 million board feet of lumber were shipped out of Budd Inlet, passing Dofflemeyer Point. Besides lumber, other freight included canned fruit from an Olympia cannery and shellfish from local processing plants. 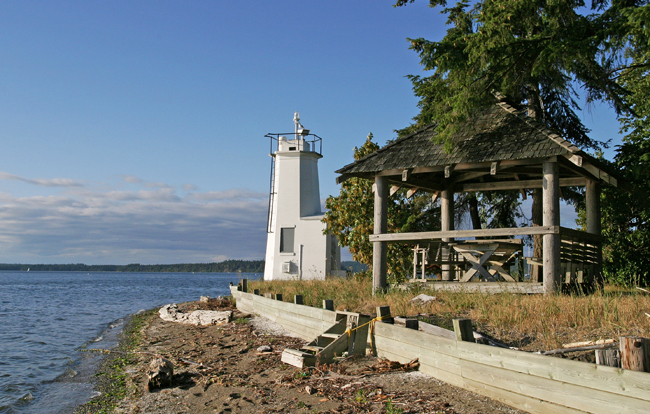 As a result of the increased shipping in Budd Inlet, Dofflemeyer Point Light was upgraded a notch in 1934 to the present thirty-foot, pyramidal concrete tower. Unlike most lighthouses, Dofflemeyer Point was never assigned a formal keeper. Instead, local residents were contracted to care for the light and activate the fog signal. The first recorded keeper of the light was Leonard Sperring, who cared for the light until 1912. Edward Robinson, who lived next to the tower, took charge of the light next and served as caretaker until 1942, when Robert Robinson, his son and next-door neighbor, took over the responsibilities. 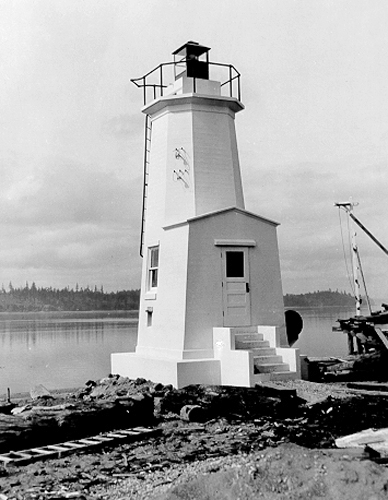 The Coast Guard automated the light in the 1960s, however, the fog signal still required manual activation. Around that time, Madeline Campbell, who lived in the house formerly owned by Edward Robinson, assumed responsibility for the tower. If fog was expected to roll in during the night, she would set her alarm clock to wake her for a nighttime check of conditions. When Mrs. Campbell and her family would leave for a vacation, they had to find a local resident to serve as a "fog horn sitter." Mrs. Campbell served as guardian of the tower until the fog signal was automated in 1987. Today, Coast Guard personnel aboard a buoy tender maintain the signal. 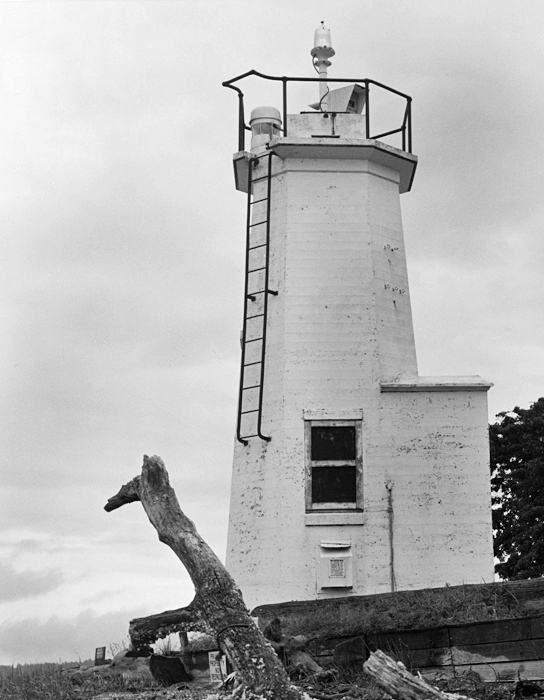 On May 1, 1995, Dofflemyer Point Lighthouse was listed on the Washington Heritage Register and was also placed on the National Register of Historic Places. Annual Report of the Lighthouse Board, 1888. Umbrella Guide to Washington Lighthouses, Sharlene and Ted Nelson, 1990. “Dofflemeyer Point Light,” National Register of Historic Places Registration Form, 1995. Lighthouses of the Pacific, Jim Gibbs, 1986. Located in Boston Harbor north of Olympia, marking the entrance to Budd Inlet. For a larger map of Dofflemeyer Point Lighthouse, click the lighthouse in the above map. From downtown Olympia, follow East Bay Drive north along the east edge of Budd Inlet. East Bay Drive will become Boston Harbor Road, which you will follow to Boston Harbor. Once in Boston Harbor, turn west on 73rd Avenue. 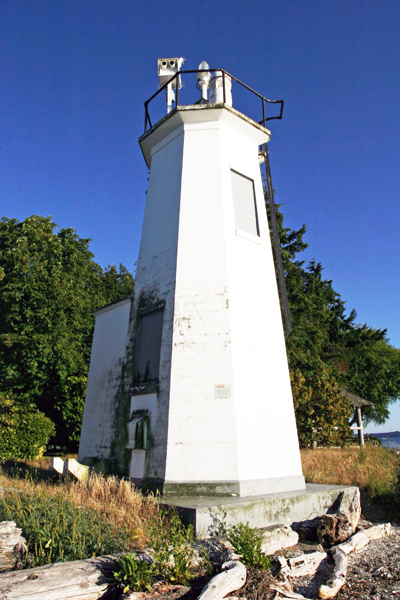 The lighthouse is located near the end of 73rd Avenue. 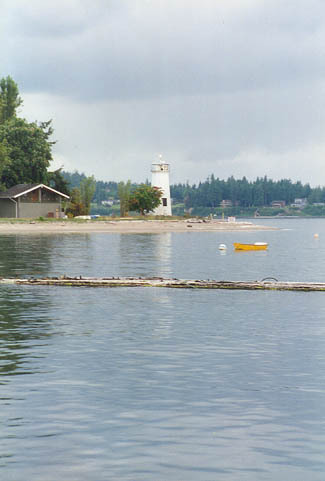 The lighthouse is surrounded by private property, but you can get a photograph of the lighthouse from the marina.